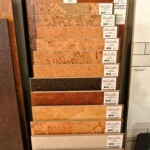 Have you heard of Cork Flooring? Chances are you have heard it mentioned but there is way more to the story than just a sustainable flooring choice! Qu-Cork’s website explains it best. “Cork consists of a tight web of up to 40 million cells per cubic centimeter. The cell membranes retain gas, giving cork its capacity to float, insulate and re-expand quickly after compression. 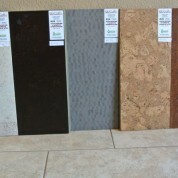 Here at Built by Design we have cork in two different sizes and over 23 different patterns and color choices. The original Cork comes in a 1′ x 3′ size. The new Designer Plank series comes in 7″ x 45″ size and comes in 5 gorgeous color choices. If you are looking for a unique alternative to tile or wood flooring you definitely should check out Cork. You will not be disappointed. From being super easy to clean and maintain,to its quiet and antimicrobial properties Cork is a flooring to be considered! If you want to find out more about this amazing product check out their website.